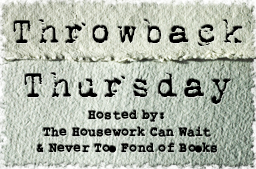 Throwback Thursday is a weekly feature co-hosted by Never Too Fond of Books and The Housework Can Wait. This is a fun way to write about and review beloved books we haven't read in a while. This week, my throwback is The Sweet Far Thing by Libba Bray. The Sweet Far Thing is the final book in the Gemma Doyle Trilogy by Libba Bray. This was the longest as well as the darkest book in the trilogy. The beginning is a little slow, but the second half will keep you engaged. There are unexpected twists and an ending that I definitely didn't see coming. Each character had their own story within this trilogy. I can't say that they all got their happy ending, but their were no loose ends left in their stories. I have a definite love-hate relationship with the ending. To avoid giving too much away, I'll leave it at that. Check out my reviews of the previous two books in the Gemma Doyle Trilogy: A Great and Terrible Beauty and Rebel Angels. To learn more about Libba Bray and her books, visit her website and blog. I'm the same way. I prefer the last book in a series or trilogy to be long. That makes it last that much longer.. in my head anyway. lol!